MS Office Trusted Location Editor – CARDA Consultants Inc. Developed out of personal need, ‘Trusted Location Editor’ is a very lightweight application that allows you to easily create, edit and delete MS Office application Trusted Locations without needing to mess around with the registry editor which, in many companies, is removed or disabled for security reasons. 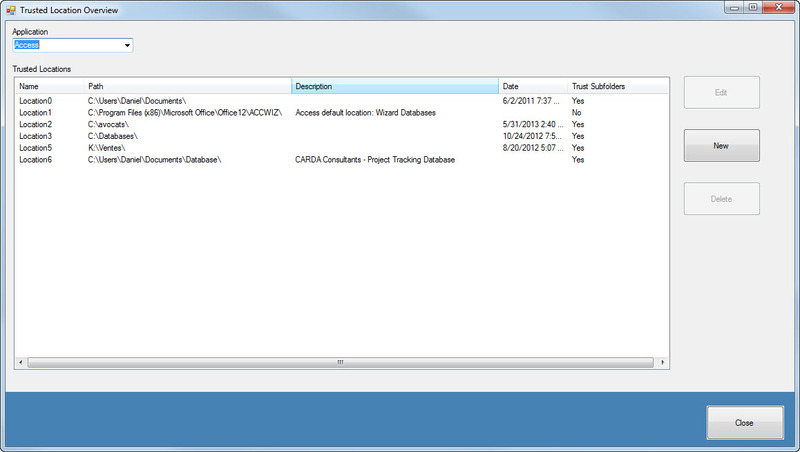 Furthermore, you can quickly, in one click, access all the Trusted Locations for all the applications on the PC. No more navigating through 5-6 different menus who’s location always changes between Office versions to try and access the Trust Center! What is even nicer is it works in run-time environment where the Trust Center is not available/accessible (MS Access Runtime editions). This is actually the reason for the creation of this application. It automatically detects any applicable software programs installed and lists them in the Application drop-down and once you select an application, it will display a listing of all the existing Trusted Locations. From there you can Create new Trusted Locations, Edit the properties of existing ones or even Delete them. Once the purchase process is completed, you will be provided with a zip file to download. Download the file to your local computer and then uncompress it to a folder of your choosing. Then simply double-click on the file to launch the program. This program requires that Microsoft .NET Framework 4 Client Profile be installed which can be downloaded from the following link Microsoft .NET Framework 4 Client Profile (Standalone Installer). Please note that this should already be installed on most recent up-to-date versions of MS Windows. No limits and/or restrictions have been place on this application. You may freely use the application, excluding for the purpose of reverse engineering, distributing or reselling it. All sales are final and no refunds will be issued as the deliverable provides the complete source code. Although we have taken steps to ensure that the software on this site is free of viruses, we provide the software ‘AS IS’ and we recommend you take the time to scan it again. In no event will CARDA Consultants Inc. be liable to the client or any third party for any damages, including any lost profits, lost savings or other incidental, consequential or special damages arising out of the operation of or inability to operate the software which CARDA Consultants Inc. has provided, even if CARDA Consultants Inc. has been advised of the possibility of such damages.